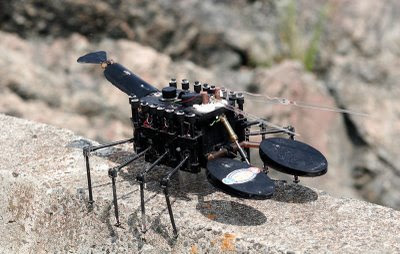 Robotic systems continue to evolve, slowly penetrating many areas of our lives, from manufacturing, medicine and remote exploration to entertainment, security and personal assistance. 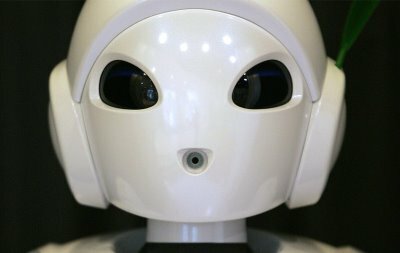 Developers in Japan are currently building robots to assist the elderly, while NASA develops the next generation of space explorers, and artists are exploring new avenues of entertainment. Collected here are a handful of images of our recent robotic past, and perhaps a glimpse into the near future. 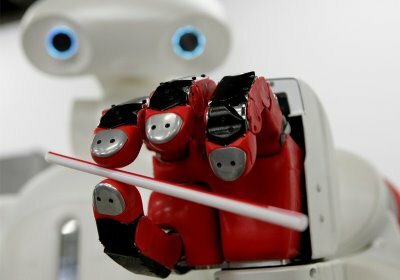 Twendy-One demonstrates its ability to hold delicate objects by manipulating a drinking straw between its fingers at the Department of Mechanical Engineering laboratory in Waseda University in Tokyo, Japan, Wednesday, Jan. 14, 2009. The sophisticated robot has been developed by the university's team, led by Dr. Shigeki Sugano, in hope of supporting people in aging societies. (AP Photo/Shizuo Kambayashi). 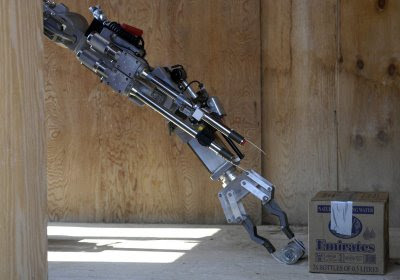 NASA's Limbed Excursion Mechanical Utility Robot (LEMUR) is being designed as an inspection/maintenance robot for equipment in space. A scaled-up version of Lemur IIa, could help build large structures in space. The Lemur IIa pictured here is shown on a scale model of a segmented telescope. (NASA/Planetary Robotics Laboratory). 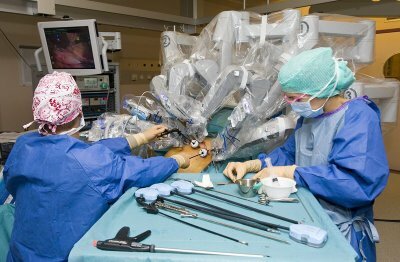 Surgeons use a robot named da Vinci to aid a hernia operation, at the University Hospital Geneva, in Geneva, Switzerland, Thursday, Nov. 13, 2008. 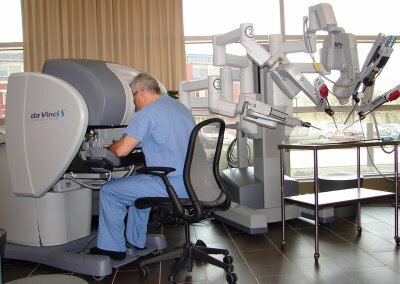 The University Hospitals of Geneva opened the department for robotic surgery in 2008, where between 50 and 80 surgeons from around the world will have the possibility to train with da Vinci each year. (AP Photo/Keystone, Salvatore Di Nolfi). 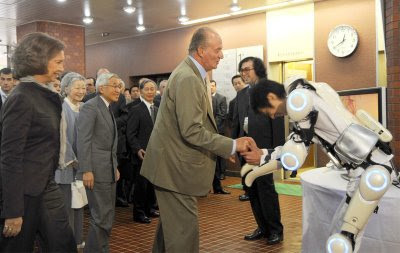 Spanish Queen Sofia King Juan Carlos, Japan's Emperor Akihito and Empress Michiko react after watching watching a performance of a robotic suit called HAL (Hybrid Assistive Limb), which can lift up to 30kg rice bags, at Tsukuba University north of Tokyo on November 12, 2008. (KATSUMI KASAHARA/AFP/Getty Images). An Explosive Ordinance Disposal robot places an explosive device next to a suspicious package during a demonstration conducted by members of the Special Operations Command Central Command Explosive Ordinance Disposal Unit for participants of the Joint Civilian Orientation Conference 72, at Camp Lemonier, Djibouti, Oct. 21, 2006. 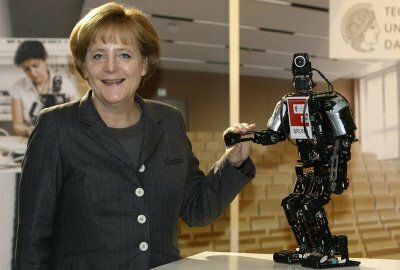 German Chancellor Angela Merkel poses with a robot called "Bruno" at the stand of the Darmstadt University of Technology during the third national IT summit in Darmstadt November 20, 2008. (REUTERS/Alex Grimm). 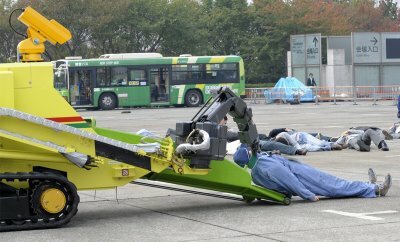 Tokyo Fire Department's rescue robot transfers a mock victim onto itself during an anti-terrorism exercise in the response to a radiological dispersal device in Tokyo, on November 7, 2008. Tokyo Metropolitan government conducted the exercise with eleven organisations including Metropolitan Police Department. (TOSHIFUMI KITAMURA/AFP/Getty Images). A biomimetic underwater robot, named "RoboLobster", designed by Professor Joseph Ayers, is seen, Aug. 17, 2007, in Nahant, Massachusetts. RoboLobster is intended to be used to recognize changes in seawater and to locate and destroy underwater mines. (Robert Spencer). Two All-Terrain Hex-Legged Extra-Terrestrial Explorer (ATHLETE) rovers traverse the desert terrain adjacent to Dumont Dunes, CA. 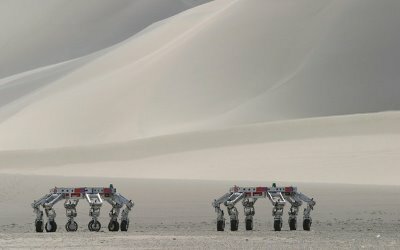 The ATHLETE rovers are being built to be capable of rolling over Apollo-like undulating terrain and "walking" over extremely rough or steep terrain for future lunar missions. (NASA). A Toyota Motor Corporation robot is pictured at a showroom in Tokyo December 11, 2008. (REUTERS/Michael Caronna). Milton Hospital urologist Dr. Clifford Gluck at the controls of the da Vinci surgical system on April 23, 2008 in Milton, Massachusetts (Boston Globe/Milton Hospital). 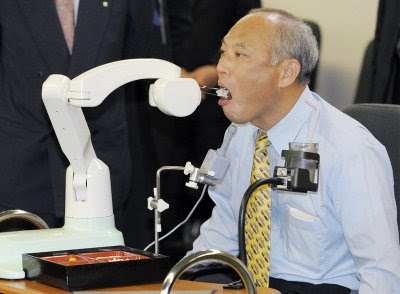 apan's Health Minister Yoichi Masuzoe sits with an assistive robot called "My Spoon" during a demonstration of health care robots in Tokyo on November 10, 2008. "My Spoon", developed by Japan's Secom is designed to help disabled people eat meals with joystick for controls using one's jaw, hand and feet. (AFP PHOTO/JIJI PRESS). 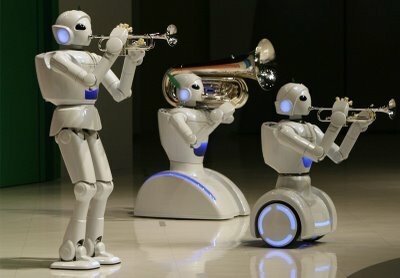 Toyota Motor Corporation partner robots play instruments at the company's showroom in Tokyo on May 4, 2008. A mock intruder, tangled in a net that was launched by the remote-controlled security robot T-34, lies on the floor while posing beside the robot in Tokyo January 21, 2009. T-34 users can see live images from the robot's camera and control the robot using a mobile phone. 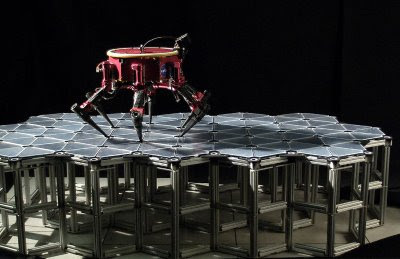 The robot, which has sensors that react to body heat and sound, can launch a net against an intruder by remote-control during its surveillance. (REUTERS/Kim Kyung-Hoon). 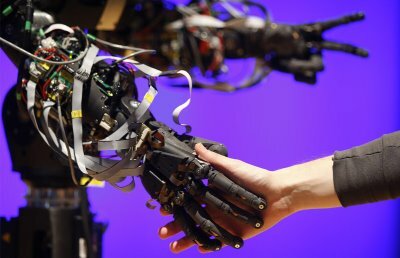 A man shakes hands with robot 'Berti' at the Science Museum in London, Tuesday, Feb. 17, 2009. 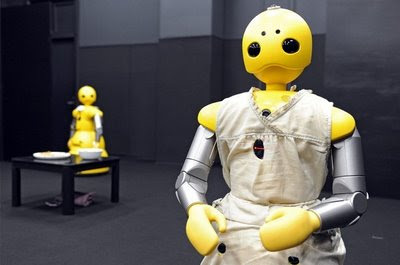 The robot, a life size humanoid robot, is built to mimic human gesturing, and is on show at London's Science Museum from Feb. 17 to 19. (AP Photo/Kirsty Wigglesworth). 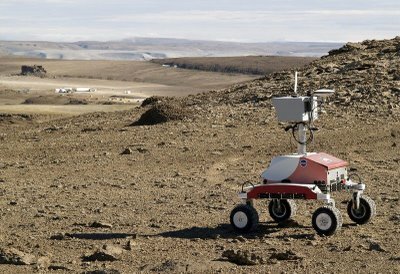 NASA's K-10 Rover "Red", an experimental survey and exploration robot, uses its 3-D scanning systems during field tests in the "frost rubble zone" of Earth near Moses Lake, WA in June of 2008. (NASA/Ames Research Center). 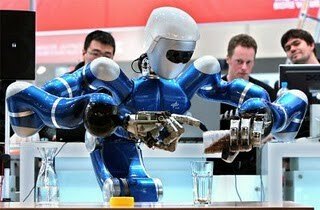 Fair visitors look at the humanoid robotic system "Rollin' Justin" preparing a tea on March 2, 2009 at the world's biggest high-tech fair CeBIT in Hanover, central Germany. (RONNY HARTMANN/AFP/Getty Images). 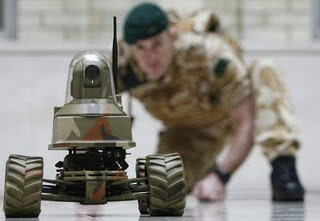 A Royal Marine poses for photographers with the Unmanned Vehicle Robot, Testudo, at the launch of the Defence Technology Plan in London February 26, 2009. (REUTERS/Luke MacGregor).